Joseph Butler (May 18, 1692 – June 16, 1752) was an English bishop, theologian, apologist, moral philosopher and the author of Fifteen Sermons (1726) and The Analogy of Religion, Natural and Revealed, to the Constitution and Course of Nature (1737). He asserted that morality was an essential and undeniable aspect of human nature and that benevolence was as much a natural tendency as self-interest. He separated human nature into three elements: passions and affections, self-love and benevolence, and conscience; and placed these elements in a hierarchy, with conscience as the highest authority. He regarded the conscience as a secular faculty that reviewed and passed judgment on the motives and tendencies of the other aspects of human nature, but for religious people conscience was also the voice of God. Since human beings existed in community, and self-interest was served by benevolence in many ways, he held that the conscience seeks the good of the whole rather than the individual. Butler defended natural and revealed religion through a doctrine of probability; since there was no conclusive evidence that religious doctrine was not true, there was a greater probability that it was. He responded to skeptics, who criticized apparent inconsistencies and contradictions in the Bible and in religious doctrine, by pointing out that similar inconsistencies and contradictions could be observed in the natural world. He defended revelation by characterizing it as beyond the sphere of human intellect and therefore incomprehensible to it. Butler's ideas on ethics and his defense of religion influenced the British and American philosophers and theologians of the eighteenth and nineteenth centuries. His sermons have received more attention from secular philosophers than many other religious sermons in history. Butler was born May 18, 1692, in Wantage, Somerset, England. The son of a Presbyterian linen-draper, he attended Samuel Jones’ dissenting academy at Gloucester and was destined for the ministry of that Church. His most intimate friend at the academy was Thomas Secker, later archbishop of Canterbury. Butler became dissatisfied with the principles of Presbyterianism, and resolved to enter the Church of England, going to Oxford in 1714. He began to study Samuel Clarke's Demonstration of the Being and Attributes of God, and at the age of 22 secretly wrote to Clarke with questions regarding the proofs of the unity and the omnipresence of the Divine Being. Clarke included this correspondence in the later editions of the Demonstration. In March 1715, Butler entered Oriel College, Oxford, where he formed a friendship with one of the resident fellows, Edward Talbot, son of William Talbot, then bishop of Oxford. In 1718 he was ordained deacon and priest, and on the recommendation of Talbot and Clarke, was nominated preacher at the Rolls chapel in Chancery Lane, London, where he remained until 1726. It was at the Rolls that he preached his famous Fifteen Sermons (1726), including his well-known discourses on human nature. In 1721 Butler was been given a prebend at Salisbury by Bishop Talbot, who later gave him the living of Houghton-le-Skerne, and in 1725 presented him to the wealthy rectory of Stanhope. He resigned his preachership at the Rolls in 1726. 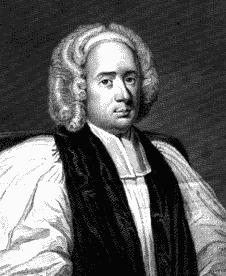 In 1733 he became chaplain to Lord Chancellor Talbot, the elder brother of his dead friend Edward, and three years later, prebendary of Rochester. In 1736 he was made the head chaplain of King George II's wife Caroline, on the advice of Lancelot Blackburne. The same year he published his masterpiece, The Analogy of Religion, Natural and Revealed, to the Constitution and Course of Nature (often cited simply as "Butler's Analogy"). A treatise appended to the main work, Of the Nature of Virtue, established him as one of the foremost British writers on ethics. Before her death in 1737, Queen Caroline recommended Butler to King George, and in 1738 he was appointed bishop of Bristol. Butler’s acceptance letter to the king showed some resentment at being appointed to Bristol, one of the poorest sees in England. Two years later, however, Butler was appointed to the wealthy deanery of St. Paul’s and in 1746 he was made clerk of the closet to the king. He became Bishop of Durham in 1750, and expended large sums in building and decorating a church and residence there, though his private expenses were very small. Soon afterwards his health deteriorated, and he died June 16, 1752 at Bath, where he had gone to recover. He was buried in the cathedral of Bristol. A monument was erected over his grave in 1834, with an epitaph by Southey. At his own request, all of his original manuscripts were burned. He was of a most reverend aspect; his face thin and pale; but there was a divine placidness which inspired veneration, and expressed the most benevolent mind. His white hair hung gracefully on his shoulders, and his whole figure was patriarchal. Though indifferent to general literature, he had some taste in the fine arts, especially architecture. In the calendars of the Anglican Communion his feast day is June 16. Butler is most famous for his Fifteen Sermons on Human Nature (1726) and Analogy of Religion, Natural and Revealed (1736), with its accompanying treatise, Of the Nature of Virtue. The Fifteen Sermons are still widely read and have attracted the attention of secular philosophers more than any other series of religious sermons. They deal chiefly with human nature and its implications for ethics and practical Christian life. The first three Sermons in particular present a systematic account of the moral nature that Butler believed all human beings to possess. The Sermons on Human Nature is commonly studied as a response to Hobbes' philosophy of ethical egoism. The Analogy is an important work of Christian apologetics. The second part includes an argument against deism, which was raising considerable concern in the churches in England at that time, and modern scholars have tended to view the whole work as a reaction to deism. Of the Nature of Virtue established Butler as one of the foremost British writers on ethics and is frequently read independently. Butler’s writings show him to be a serious and thoughtful Christian, deeply concerned about the decay of religious life in England as a nation and in the church. He sought a means of reviving the Christian spirit without resorting to the mystical excesses of the Evangelical revival that was then beginning to come into force. Butler has come to be regarded as a proponent of highly intellectual theology, described by Horace Walpole as "wafted in a cloud of metaphysics." Yet he refused as a matter of principle to write speculative works or to pursue his own curiosity. All of his writings were directly related to the performance of his duties as a clergyman, or to the advancement of his career. His purpose was not to establish a system of religious philosophy, or to prove that religion is true, but to defend religion against the objections of the skeptics and to provide an intelligent justification for the acceptance of established religious beliefs. Many of the propositions that he suggested did not lend themselves to demonstrative argument. Butler preferred to occupy his mind with the practical aspects of religion and morality than to grapple with the deepest problems of metaphysics. Butler’s literary style was not appealing; it was the force of his arguments that gave his works power and made them effective. His writing was sometimes confusing and difficult to read; he qualified his arguments extensively, and his approach of always writing with the opposing point of view in mind was said to raise more questions than it answered. The care and precision with which Butler discussed minor details sometimes distracted the reader from the main direction of the argument. Butler set out to naturalize morality and religion by arguing that morality is an essential aspect of human nature, and that human nature is particularly suited to virtue. To dismiss morality is absurd, since it would amount to dismissing part of our own humanity. In his famous refutation of Hobbes, he showed that benevolence is as much a part of human nature as self-love, and that the instinct to serve one’s own interests was compatible with the instinct to seek the well-being of others. This was supported with evidence that tendencies towards benevolence existed in man, and that benevolent actions benefited the interests of the individual in various ways, including feelings of self-satisfaction and increased cooperation with society as a whole. …it will as fully appear that this our nature, i.e. constitution, is adapted to virtue, as from the idea of a watch it appears that its nature, i.e. constitution or system, is adapted to measure time. The first of Butler’s Fifteen Sermons analyzed human nature by dividing it into three elements: passions and affections; self-love and benevolence; and conscience. He placed these elements in a hierarchy, with conscience as the highest authority. The conscience, which he called the Principle of Reflection and the Reflex Principle of Approbation, was a faculty that considered all the motives and propensities to action and passed judgment on them, approving some and disapproving others. Though Butler sometimes referred to the conscience as the voice of God, he clearly believed in the autonomy of the conscience as a secular organ of knowledge. The conscience was the supreme authority, if not the supreme power. Man was under obligation to obey the law revealed by his conscience, because it was the law of his own nature. The conscience, moreover, unmistakably favored conduct that served justice, truthfulness and the general good. Virtue consisted of following the true law of nature, one’s conscience. He held "that mankind is a community, that we all stand in a relation to each other, that there is a public end and interest of society, which each particular is obliged to promote." In the nature of a religious person, who believed that conscience was the voice of God, it had even greater authority: "consciousness of a rule or guide of action, in creatures capable of considering it as given them by their Maker, not only raises immediately a sense of duty, but also a sense of security in following it, and a sense of danger in deviating from it." Butler considered that all human hopes and fears were founded on the expectation of a future life. In the first chapter of Analogy of Religion, Natural and Revealed, he argued that human knowledge of the nature of death was insufficient to guarantee that death is the absolute end of human existence. Since it was not certain that death was the end of existence, we should live and act as though there were an existence beyond death. Butler gave several forms of evidence that suggested that immortality was a reality. From human experience we could not infer that immortality was impossible; instead human experience furnished probably reason for inferring that immortality was a fact. If the physical lives of human beings on earth were examined, life appeared to be unjust. This raised three possibilities: God and the universe are ultimately unjust; contrary to appearances, the world is just in a way that we cannot understand; or the universe is just when viewed from a broader perspective than this earthly physical life. Butler believed there were practical reasons for accepting the third possibility. Butler embraced the Platonic idea that a person does not truly benefit by acting in a harmful and malicious way and then escaping the consequences and avoiding punishment. Butler asserted that it was not unreasonable to suppose that there was a future life regulated by the requirements of ethical law, since the existence of such a life would be compatible with our existence on earth. Experience showed that our happiness or misery in this life depended to a great degree on our conduct; there was no argument to support the possibility that a future life would be any different. Furthermore, in the natural world fortuitous or disastrous events followed as a consequence of certain actions. It was therefore probable that any future happiness or unhappiness would be governed by conduct in the present. Butler accepted the distinction between natural religion (religious truth which can be understood by examining the natural world) and revealed religion (religious truth which can only be understood through special, revealed knowledge). Analogy of Religion, Natural and Revealed, was intended as a defense of natural and revealed religion against those who declared that they were incompatible with reason, and who found in the Bible scriptures which appeared to be at odds with the concept of a just and loving God. Butler appealed to a doctrine of human ignorance, saying that revelation lay beyond the sphere and reason and could not be grasped by human intelligence. He pointed out that numerous phenomena in nature were equally mysterious and inexplicable, because man had not yet acquired the knowledge to understand them. Reason was the faculty by which man acquired knowledge and made judgments, but it could not supply a complete and perfect comprehension of the whole system of nature. Therefore, until something had been conclusively proven to be untrue, we must always allow for the probability that it was true. We cannot have a thorough knowledge of any part without knowing the whole…… to us probability is the very guide of life. Butler pointed out that the inconsistencies and contradictions in the Bible and religious doctrine were no greater than the inconsistencies and contradictions found in nature, whose author was admitted to be God. Therefore they should not be considered a valid objection to the truth of religious doctrine. He attributed these contradictions and difficulties to an incomplete understanding, and endeavored to show that an examination of nature would make religious principles seem increasingly probable rather than contradicting them. The doctrines of natural religion were drawn from experience and reason, and positive proof of them was to be found in revealed religion, which disclosed to man further truth that could not be discovered in nature. The general analogy between the principles set forth by biblical revelation, and the principles which could be observed in nature, indicated that there was one Author of both. Butler regarded revealed truth as supplemental to the religious knowledge that could be gained from the examination of nature. Revelation should not overrule reason; if any biblical teaching appeared to be immoral or in contradiction to the knowledge acquired by man’s natural faculties, it was necessary to seek another interpretation of that scripture. By the late eighteenth century, Butler was widely studied in Scottish universities, and from the early nineteenth century at Oxford, Cambridge and many American colleges and universities. David Hume and John Wesley were impressed with Butler’s work, though not always in agreement with him. Reid, Smith and David Hartley considered themselves Butlerians. Babbage, C. Ninth Bridgewater Treatise. London: J. Murray, 1837. Babolin, A. Joseph Butler. Padova: LaGarangola, 1973. 2 vols. Bartlett, T. Memoirs of the Life, Character and Writings of Joseph Butler. London: John W. Parker, 1839. Ramm, B. "Joseph Butler" in Varieties of Christian Apologetics: An Introduction to the Christian Philosophy of Religion, Baker Book House, Grand Rapids, 1962. pp. 107-124. This page was last modified on 7 June 2018, at 18:45.